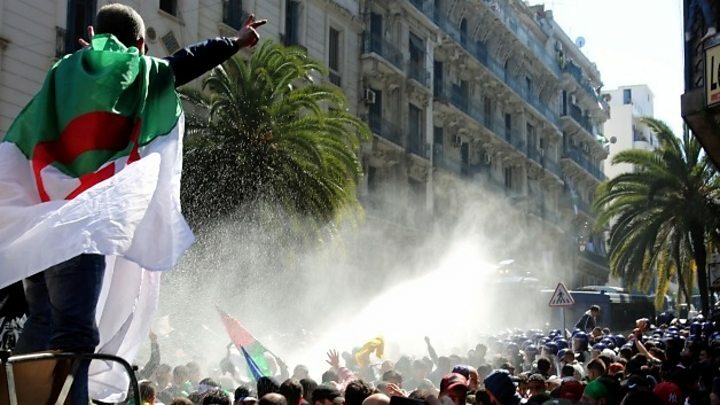 President Abdelaziz Bouteflika of Algeria has announced a major cabinet reshuffle, after weeks of protests with demonstrators demanding he resign. State TV reports 21 of the country’s 27 ministers have been replaced. Noureddine Bedoui will remain as prime minister, says Ennahar TV. 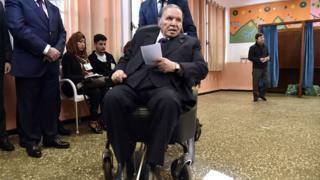 President Bouteflika keeps his title as defence minister, just days after Algeria’s powerful army chief, Gen Ahmed Gaed Salah, urged the ailing president to stand down. Other new cabinet members include Sabri Boukadoum who will reportedly replace Ramtane Lamamra as foreign minister. Mohamed Arkab will take over from Mutapha Guitouni as energy minster, while finance minister Abderrahamane Rouia has been replaced by central bank governor Mohamed Loukal. The appointments have not been officially confirmed by the government. Meanwhile, a top Algerian businessman with ties to Mr Bouteflika has been arrested while trying to cross into neighbouring Tunisia, local media say. Ali Haddad is one of the country’s richest men and a long-time backer of the president. Algerian media say Mr Haddad, 54, was carrying a British passport and large sums of money when he was arrested trying to cross the Tunisian border by car in the early hours of Sunday. The reason for the reported arrest is not clear. Mr Haddad recently resigned as head of Algeria’s employers’ organisation, FCE. He went from managing his family’s small hotel to commanding a vast business empire with interests in construction, sports, media and healthcare, among others. Analysts say he was much part of Mr Bouteflika’s inner circle. Under his tenure, the FCE backed the president’s bid for a fifth term in elections scheduled for April – a position it later retracted as his popularity waned. The president has since dropped his plans but still remains in office. Now aged 82, he has rarely been seen in public since suffering a stroke in 2013. How likely is an Assange conviction in US?